To see more fresh holiday products, click here. Families who want that get-together spirit to last through the New Year are expected to load up on games for the holidays. Retailers from New York to California report that games, puzzles and other traditional toys are among kids’ and grown-ups’ favorite buys. And now that Imagination Entertainment has transformed the newspaper puzzle craze, Sodoku, into a board game, 2005 might be the best holiday season yet for games. Across town, Linda Wagness, manager of Imaginit, found the same buying trend. “We do an awful lot in board games and the smaller packaged games, such as Quiddler [Set Enterprises] and Blink [Out of the Box Publishing],” she told TDmonthly. “Wooden puzzles and games” sell well for Sara Evers, owner of Dancing Bears in Rochester, Minn. “We're in a touristy type town, where people are wanting something to do.” She expected the trend to hold for Christmas. “There's a new word game I'm doing well with: Wordigo by River Edge Game Co. … It’s a great family game,” said Gladys Griffin, owner of Main Street Toy Shop in Columbus, Ga.
“Blokus [Educational Insights] is huge,” said Terri Bracken, owner of Earth Explorers Toys in Zionsville, Ind., though some retailers have found it falling off lately. “Spy Alley [Spy Alley Partners LLC] is a great game.” She also recommended Front Porch Classics’ Dread Pirate and Old Century Baseball as holiday gifts. The passion for games wasn’t just a flyover phenom, either. The coasts, traditionally less traditional, had similar reports. “When we ask our customers what they’re thinking about buying for the holidays, they mention big things … but then they buy a bunch of little things,” noted Jude Larene, owner of Izilla Toys in Seattle. Board games “that parents had as kids,” such as Chutes & Ladders by Hasbro, were doing well at Portland, Ore.’s Finnegan's Novelties & Toys, commented manager Jordan Walden. “Bzz Out and Rat-a-Tat Cat [Gamewright] are good sellers and make great stocking stuffers for little kids,” said Eric of Gamescape in San Francisco. For older children, he recommended Fluxx by Looney Labs. “We always sell a lot of Rivers, Roads and Rails by Ravensburger,” noted Doris Jelliff, bookkeeper for Dinosaur Hill in New York City. “Younger kids love Kids on Stage [Growing Tree Toys] and … Mighty Mind [Leisure Learning Products Inc.], which is a puzzle-type thinking game that’s used as an entrance exam for some of the top preschools,” said Michael Stone, manager of the Children’s General Store in New York City. Apples to Apples and Rush Hour were still cited as “hot” by most retailers. Others were keen for Blue Orange’s Zimbbos, Scoop’s Surprises and Gobblet Jr.; games by Cranium; Space Faces by Educational Insights; Zingo by ThinkFun; Magic: The Gathering [Wizards of the Coast]; Yu-Gi-Oh [Upper Deck Entertainment] and Hasbro’s Scattergories and, of course, Monopoly, which “still keeps on selling,” said Joseph Baiocco, manager of Big Top of Scarsdale in Heathcote, N.Y.
Bzz Out is an entertaining card game that teaches numbers and counting as well as elementary strategy. Through the game play, children learn about the relationships between numbers and practice their counting skills by deciding which number is higher. Players also learn some basic probability and strategic thinking skills as they decide whether to keep or swap their cards. It’s won an Oppenheim Toy Portfolio Platinum Award, Parents' Choice Gold, Dr. Toy’s Best Vacation Products and a top prize from the Canadian Toy Testing Council. 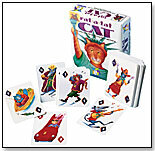 Players get rid of the high cards (rats) and go for the low cards (cats) in this poker-style game with cat- and rat-decorated cards. As children play Rat-a-Tat Cat, they develop a sense of timing and an understanding of basic, but essential, mathematical concepts. They also begin to develop an intuitive sense of probability. It’s won an Oppenheim Toy Portfolio Platinum Award, Dr. Toy’s Best Vacation Products, Mensa Select and a Canadian Toy Testing Council “Children’s Choice” Award. — Mark Truax, store manager at Try & Buy Toy Stores in Katonah, N.Y., said this game is “up there in the top” of its best-selling card games. — “Gamewright is a strong seller for us,” Colleen Nelson, owner of Goodie Gumdrops in Burien Wash., told TDmonthly in summer 2008. — Five percent of 64 retailers named Rat-a-Tat Cat as one of their top-selling card games in August 2008, and three of 38 echoed the same in late summer 2009. “It’s been our best seller for seven years,” Jennifer Schneeweis, owner of Izilla Toys in Seattle, told TDmonthly in August 2009, citing sales of 24 units monthly. The card game with ever changing rules. It starts out simple, with just the Basic Rule card: draw one card and play one card during each player's turn. But New Rule cards quickly make things chaotic. Even the object of the game will often change, as players swap out one Goal card for another. ― “Fluxx: A card game from Looney Labs. A game where the rules and win condition[s] are always in 'flux.' 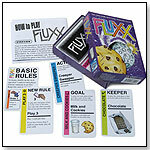 Fluxx had been a best seller since we opened [in 2004],” said Ed Evans, owner of All Things Fun! in West Berlin, N.J., in March 2007. The world's a stage, especially when kids are playing the Kids on Stage Game. Perfect for even young kids because no reading is required, Kids on Stage Game gives kids the chance to act out items in this charades-type game meant to put every young player in the spotlight. Every player gets to act and move and have fun, and they can do it on their own since an adult doesn't have to read for them. The Kids on Stage Game is the creative game that encourages activity and helps develop communication skills — plus it is fun to see what each player is going to do next. — “We sell a lot of games called Kids on Stage, said Christine Hildebrand of Alphabet Toys in Davis, Calif. She claims to have had such great success because of the wide age range the game appeals to, and “probably because we kind of like it,” she told TDmonthly. MightyMind by LEISURE LEARNING PRODUCTS INC.
Other products from LEISURE LEARNING PRODUCTS INC.
MightyMind is a creative play-alone activity for children ages 3 to 6. MightyMind was an original winner of the Parent's Choice Toy of the Year award. It has been three times nominated by Parenting Magazine to the Toy Hall of Fame. It sells in 22 countries from Europe to Asia. MightyMind and its sequel, SuperMind, keep kids busy and happy for more than half an hour. No reading or language is required, and it teaches kids everything they need to know to solve and build complex jigsaw puzzles. MightyMind "Makes Kids Smarter." — “They can take them in the car and the pieces stick inside the tin box,” Terri Watkins, an employee at Interactive Toys Crafts and More in Cle Elum, Wash., told TDmonthly about the magnetic version of Mighty Mind, an evergreen seller. There are 140 picture tiles that show segments of rivers, roads and rails. Players put all of the picture tiles face down in the box or on the playing surface. 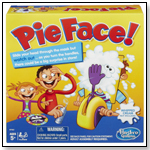 Each player draws two picture tiles from the box and puts them face up. The players then take turns adding their picture tiles on to an expanding network of rivers, roads and rails. But there’s a catch! Some tiles may have rivers and some may just have roads and rails, so players may not always be able to make a match. If this is the case, another picture tile is drawn from the box and the player waits for the next turn. Once the picture tiles from the box are gone, the first player to get rid of all of his or her tiles wins. For one to eight players. — “Children can pick it up,” retailer Frances Frinfrock told TDmonthly, “but it’s good for adults, as well.” The owner of Aunt Franny’s Toys has had wonderful success with Rivers, Roads and Rails. Scoop, the Ice Cream Man, is starting a new Sunday tradition to promote his surprise ice creams: Each ice cream hides a different flavor. Taking turns, players shuffle the ice creams and ask other players to find the hidden flavor of their choice. The player with the most flavors wins the game. This all-wood game includes four wooden ice cream cones and 12 wooden ice cream flavors. For one to six players. Gobblet Junior brings the award-winning, fun game of strategy to the whole family. Gobblet Junior plays just like Tic-Tac-Toe except that players can gobble up their opponents and move their pieces around the board. The first to line up three pieces in a row wins. Fun, strategy, memory and surprise are always part of the game. — Two of 38 specialty toy retailers named Blue Orange when discussing best-selling wooden toys in February 2010. Milton Bradley Chutes & Ladders by HASBRO INC.
Chutes and Ladders is the game of rewards and consequences. As kids travel along the game path, they encounter situations that reward them for good deeds by letting them climb the ladders or punish them for misbehaving by sending them down chutes. All the while, they are learning to recognize numbers and count to 100. Included are a game board, spinner with arrow, four pawns and instructions in English and Spanish. ― “Logic games are selling very well, particularly (those from) ThinkFun,” Amy Akin, manager of Giggles for Kids in Suwanee, Ga., told TDmonthly in early 2009. ― “We do really well with ThinkFun games — problem solving, like Rush Hour,” added William Bingham, owner of Firefly Toy Shop in Milford, Pa. When asked about best-selling item for tween boys in October 2009, Fred Meyer, owner of Meyer's Toy World in Battle Creek, Mich., told TDmonthly, “Rush Hour is great. 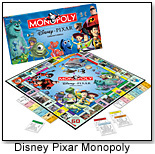 We sell hundreds.” It was named a best-selling game by five of 38 retailers in Feb. 2010. During a summer 2010 survey of 40 retailers, two said Rush Hour from ThinkFun is their top-selling puzzle, citing sales of up to 60 pieces per month. Quiddler by SET ENTERPRISES INC.
Other products from SET ENTERPRISES INC.
A fast word game played with cards, Quiddler is designed for 1 to 8 players. Each game consists of eight hands. The first hand is played with three cards, and a card is added during each hand until the players begin the final hand with 10 cards each. The object of the game is to combine an entire hand into words of two or more letters, drawing and discarding on each turn. The first player to have an entire hand of words goes out. Quiddler is a deck of 181 cards. — In summer 2007, two of 32 retailers cited Quiddler as a best-selling card game in their stores. Of 64 retailers surveyed in August 2008, nine named Quiddler as their top-selling card game. One year later, four of 38 retailers cited it as a best-selling card game. In August 2010, 12 percent of 43 retailers named Quiddler a top seller in the card game category, with one citing sales of 96 monthly. Blink is a lightning-fast game where two players race to be the first to play all of their cards. Using sharp eyes and fast hands, players quickly try to match the shape, count or color on the cards. The first player out of cards wins. Fast and portable, Blink is instant fun for everyone. — Two of 32 retailers who spoke to TDmonthly in summer 2007 cited Blink as a top-selling card game in their specialty stores. Three of 64 retailers named it as a best-selling card game in August 2008. — In early September 2009, Andrew Wage, owner of Building Blocks Toy Store in Chicago, said his store sells about 10 to 20 units per month of this game. — “Sales of Apples to Apples have doubled for us every single year … since 1999. We’ve now sold over two million games!” Matt Mariani, director of marketing for Out of the Box, excitedly told TDmonthly Magazine. — Apples to Apples was picked as No. 2 of 18 toys evaluated by TDmonthly’s Homeschoolers Roundtable for lasting value. “It’s very, very popular not only for those at our house, but with friends who come to visit,” summed up Roundtable Editor Susan Ledford. Players try to fill their Zingo! cards with matching tiles from the Zingo Zinger. The first player to fill his or her card wins. Rules can be adjusted to favor more or less competition among players, and to vary the length of time each game requires. This game was a 2007 T.O.T.Y. Nominee for Specialty Toy of the Year. "It teaches memory, matching, vocabulary and social interaction skills. Kids have so much fun playing again and again; they don’t realize they’re learning essential thinking skills," Marketing Communications Manager Emily Peters of Thinkfun told TDmonthly. — “Customers use this game as their ‘standard’ party gift,” Owner Elaine Hackney of Boing! JP’s Toy Shop in Jamaica Plain, Mass. told TDmonthly in summer 2007. — “We sell out as soon as they come in,” added Pam Horwitz, manager of Mr. Toad’s Toy Company in Naples, Fla. Four of 63 retailers singled out Zingo! as the hottest-selling game in their store. 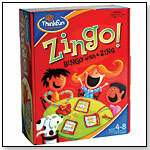 Seven percent of 56 retailers listed Zingo as a top-selling game in January 2009. Six of 38 retailers called it a best-selling game in Feb. 2010. Space Faces by EDUCATIONAL INSIGHTS INC.
Other products from EDUCATIONAL INSIGHTS INC.
Space Faces is an outer space search-and-rescue mission. It´s a race to identify stranded galactic travelers by the colors of their "space faces." Comes with a game board with 120 unique space faces, an alien identification device, 20 purple aliens, four rescue craft and a guide. Players get 10 wooden building blocks, a timer ticking per the number rolled and a card showing players what to build in that time. When the time is up, players total the points on their completed building cards and collect tokens. After four rounds, the one with the most points is the winning builder. The game comes with an expert version as well. Travel Blokus by EDUCATIONAL INSIGHTS INC. This compact two-player edition of Blokus is an on-the-go strategy game. It takes less than a minute to learn, yet has the depth to challenge both beginners and experts. Players alternate placing their game pieces on the board, touching at the corners only. With one move a player can block an opponent, but open up lots of future moves. Addictive? Yes. Mind-bending strategy? Definitely! It includes a gameboard with 196 recessed squares and 42 vibrant, translucent game pieces in a storage tray. THIS PRODUCT IS NO LONGER DISTRIBUTED BY EDUCATIONAL INSIGHTS. 12/4/08. Deceptively simple and surprisingly intense, Spy Alley keeps players on the edge of their seats. Players become a spy for their given country and try to uncover their opponents’ identity while keeping their own identity a secret. Players use deductive reasoning to expose other spies while attempting to complete their mission by obtaining the necessary codebooks, disguises, keys and passwords. — It sold out at three different online sites. — It has won multiple awards including those from Mensa, Family Life Magazine, Games Magazine and Parents' Choice. Desert islands, treasure, hungry sharks, treacherous seas and, of course, pirate battles all await you in Dread Pirate. This beautiful coffee table game comes packaged in an authentic wooden treasure chest and is played upon a wonderfully illustrated cloth treasure map. Choose a ship and a port of call, and set sail in search of treasure. Trade in a foreign port or sail broadside to another captain and take your best shot. Be the first pirate to collect all types of jewels and land on Dread Island to become the most feared and powerful captain on the high seas. Journey back with your family for a high seas treasure hunting, pirate adventure! Perfect for four players. This ever-popular board game combines crossword puzzles with letter unscrambling to produce hours of intellectual fun. Wordigo gives 1 to 4 players different boards (depending on the difficulty level) and allots them seven minutes to accumulate as many points as possible. Wordigo was a 2004 Parents´ Choice Gold Award Winner, as well as a GAMES Magazine Best 100 Games of the Year for 2005. This FamilyFun Magazine Toy of the Year Award Winner is now available with your favorite Major League Baseball team logos. Exquisitely detailed and crafted of high-quality wood, this retro pinball-style game allows you to bring America’s favorite pastime into your family room or den. Truly an authentic tribute to the grand ol’ ballparks of yesteryear and a “must have” for any baseball fan. In 1993, the Magic: The Gathering trading card game started a gaming revolution that continues today with six-million players worldwide. This CD-ROM features exciting games that cover the key aspects of Magic play, plus the Magic Online program. You can join one of the biggest communities of players and participate in local events and global tournaments. 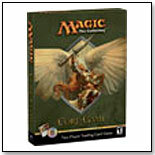 Additionally, the game box includes two decks featuring illustrated cards of creatures and spells, a 14-card pack with more advanced cards for expanded game play, a collectible premium card, two play guides for step-by-step play, an easy-to-read rulebook, two playmats with scorekeeping counters and a credit for online versions of all the cards. — “I couldn't even quantify how many of these I sell,” said Dustin Gilliland, owner of Crimson Castle Chess & Games in Tuscaloosa, Ala., in early 2011. Created by David Penfound, a young and talented fantasy artist, this complicated puzzle includes detailed illustrations of the 12 zodiac signs. Measuring 20” x 27” when completed, this puzzle serves as a useful tool when opening up young minds to the world of astrology. — The “quality of their puzzles is probably the best in the world,” owner Kathleen Tutone of Treehouse Toys in Portland, Maine, told TDmonthly. — Ravensburger, a German-based jigsaw manufacturer, is one of the largest and best-known puzzle-makers in the United States and abroad. Duelists can now stack their decks with a collection of booster packs designed to increase complexity and power during Dueling matches. Each unique tin offers an assortment of the game´s top-selling booster packs, which include Dark Beginning 1, Dark Revelation 1, Soul of the Duelist, The Lost Millennium, and Flaming Eternity. Indian Summer by HABA USA/HABERMAASS CORP.
Other products from HABA USA/HABERMAASS CORP.
For both the young and old artists who like to create images: arrange the colorful shapes over and over again into new patterns. The next is always nicer than the one before! Magnets are stuck to the wooden shapes so they stay put in the wooden frame. Includes 88 wooden pieces and 10 motifs to copy. Wooden frame measures 26 x 26 cm. Wooden frame may also be hung on the wall. Respond! by JAX LTD INC.
Other products from JAX LTD INC. The first player lays down a category card from her hand and says a word from that category. She then starts the timer and the next player must lay down a card from his hand and name a word from his category card — but it has to start with the last letter of the word that the first player mentioned. Cards with yellow borders permit any player to respond once the timer has been set — including the person who played the card. If the timer buzzes before a word has been named, the player must draw another card from the deck. The first player to put down all of her cards wins. Most of the five families from the Homeschooling Roundtable said they played Respond! “pretty regularly” between November 2005 and July 2006. But at the Petoia household, the six kids have played the game “at least 50 times,” said Mom. 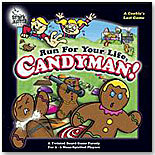 A hilarious send-up of the classic game with a similar title, Candyman! is a mad dash to escape that magical land. It seems the king is shipping off all of the candy to be eaten by children, so the gingerbread men are making a run for it. The winner is the first to make it past the border, with plenty of candied collateral damage along the way. Smirk & Dagger Games have “the ability to bring families back to the table to play together. Our thematic edge and ‘gotcha’ game mechanics … leave kids talking,” Curt Covert of Smirk & Dagger Games told TDmonthly. This 2- to 4-player game transports players back through the ages, back to the time of the Vedic Rajas of India. Chaturanga is well recognized as the earliest form of chess. Played on an authentic cloth game surface by 2, 3 or 4 players, Chaturanga combines the basic strategy of chess with the dynamic challenge of chance as each move is determined by the random roll of wooden dice. Whether players seek treasure or fun, Chaturanga is a great game for the entire family. It has so far won an Oppenheim Toy Porfolio Gold Seal Award, an Oppenheim Toy Platinum Seal Award, a Parent's Choice Silver Award and a National Parenting Center Seal of Approval. From Australia comes a new board game based on the Sudoku craze that's taken over the country. This addictive number puzzle game has already been ordered by Toys "R" Us, according to a Sudoku Web site. The exciting new game combines the logic rules of Sudoku with a random element introduced by throwing a die to make a fast and compulsive game that can be enjoyed by two or more players. "Its the first multiplayer Sudoku game," Nora Wong, director of marketing for Imagination Entertainment, told TDmonthly Magazine. Planets Scramble Squares® by b. dazzle, inc.
Other products from b. dazzle, inc.
b. dazzle’s new “Planets” Scramble Squares® brain teaser puzzle, one of four Scramble Squares® puzzle winners in Dr. Toy’s “Smart Play/Smart Toys Awards 2006, is truly a universal gift that is Easy To Play, But Hard To Solve!® for children, teenagers, adults and senior citizens of all ages. 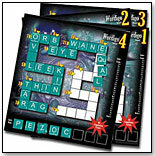 Each Scramble Squares puzzle package includes a panel of fascinating facts on the subject of the puzzle, as well as a trivia question and hidden answer, all packaged in a unique and handy resealable clear vinyl pouch which can be collected and easily stored in a standard 3-ring binder. 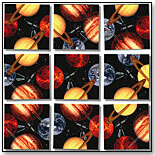 This new Scramble Square puzzle, with bold images of planets on it, is no different. The nine squares can be put together in numerous ways, but only one way is the right one for all of the planets to line up correctly. •Hollywood ToyBoy: Where Did the Year Go? •DVD Board Games: More Than Just a Passing Fad?